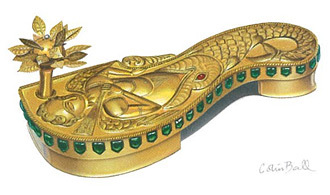 On many styles of Indian footwear, particularly the 'Paduka' or toe knob sandal style, images of fish or fish scales are to be seen. In other designs, a humanlike figure i emerging from the mouth of the fish like in the one above. Sometimes the toes of a foot are combined with the tail of a fish or a scaled body. Decorating or executing padukas in this way is based on the ten incarnations or 'avatars' of Lord Vishnu of which nine have materialized so far. The Matsya Avatar or the Fish Incarnation is the first of the ten incarnations of Vishnu, whereby the fish saved humanity and the sacred Veda texts from the Great Flood. The depicted golden paduka, adorned with precious stones, was worn during the Puja ceremony in the course of which Hindu's pray and show respect to ther deities.